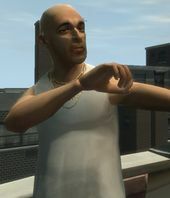 Teddy Benavidez is a character in the GTA IV Era, appearing in Grand Theft Auto IV. Teddy Benavidez is a twenty-eight year old member of the Northwood Dominican Drug Dealers who resides in Galveston Ave, Northwood, Liberty City. He is an associate of the Pegorino Family, who offer him protection. By 2008, however, the relations between the two gangs are deteriorating. Benavidez had been friends with Pegorino Family capo Ray Boccino, until he stopped paying back the money he owes Ray. Ray hires Niko Bellic to kill Benavidez. Niko travels to Teddy's last known whereabouts in Northwood where he interrogates (and has a choice of killing) Alonzo. Note: If Niko decides to let Alonzo live, Alonzo calls Teddy after Niko heads into the building to warn him and the rest of the gang that Niko is coming for him. After Niko shoots through Teddy's gang he corners Teddy alone against the buildings ledge where the ledge is damaged, with uncemented bricks. Niko can shoot Teddy or just approach him, either will make him fall through the loose bricks and to his death in the garden below. Affiliations: Linked to Dominican Street Gangs in Northwood and the Alderney based Pegorino Crime Syndicate. Dominican street dealer and thief. Operates throughout Alderney under the protection of the Pegorino Crime Syndicate. Relations between them are believed to be deteriorating. Throwing a molotov cocktail or grenade at Teddy will send him over the edge and to the ground while engulfed in flames. Teddy falling to his death. This page was last modified on 26 October 2013, at 13:46.